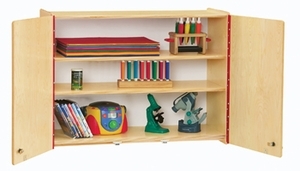 Versatile locking cabinet with two adjustable shelves. Secure diapering needs, art supplies or personal items up and out of the way. E-Z to mount wall bracket included. 35" wide x 15" deep x 26" high.